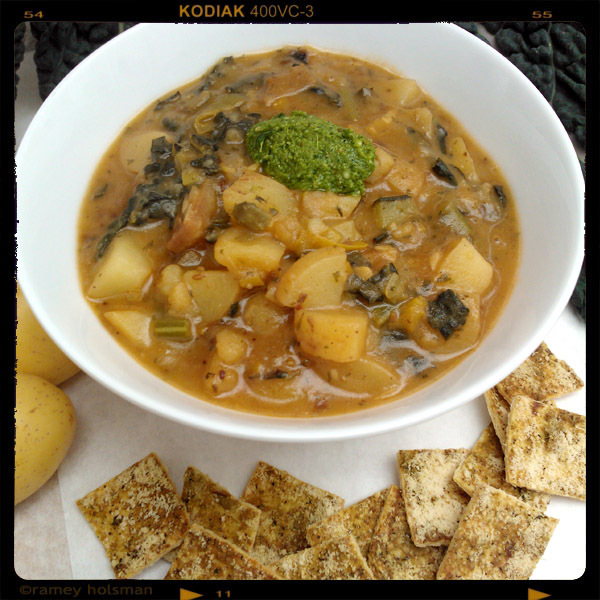 rocket-powered colcannonball chowder: This is colcannon with a kick! We only went and chowderized it. Fluffy baked potato and crispy potato skin pieces mixed into a new potato, sautéed cavolo nero (black kale), leek and onion chowder and topped with a garlicky, cheesy, sempkin flower seed, rocket pesto. There were 14 kinds of happy jigs danced after this little tummy warmer went down! rocket launchers: rocket pesto & parmesan baked tortilla crisp bread — on their own or piled on top of your colcannonball chowder. O.M.G. Beckay! hapaslaw: cabbage, carrots, mangetout, green onions, sempkin flower seeds, *cowgrrl dressing & **hapasauce. What’s a St. Patty’s Day without cabbage? o’ my guinness! moonpies: a gooey marshmallow and vanilla white chocolate pillow, group-hugged by two chocolate coconut oh my Guinness! graham-cakey-cookies. What the-!? We don’t need to say anything more about this. Have one with a glass of milk, a cuppa or, heck, even a Guinness! If you have a meeting coming up and want a lunch that will wake everyone up, call round for a céilí! We’ll create a menu just for you. *rocket pesto, rocket launchers & cowgrrl dressing contain dairy. **hapasauce contains soy and sesame.